I have endometriosis and I’ve been taking birth control pills continuously. I have a brownish discharge that I haven’t had for over 3 years and I’m worried. I have a huge workload this semester and I work out a lot at the gym. 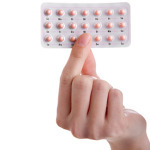 Can stress or working out cause your birth control not to work? Posted 31 October 2016 under Ask Us. As long as you are taking your birth control pills at the same time every day and you haven’t missed any doses, the Pill will work. Brown discharge, often called “spotting,” can happen while taking continuous birth control pills. This is typically nothing to be concerned about and usually goes away by itself. If you continue to have spotting despite taking your Pill on time, call your health care provider.